A Rig is an animation control system for a Model. Rigs can use different methods for animating. 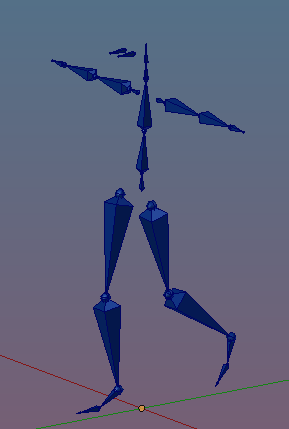 For example it is possible to animate a mesh only by using empties and constraints, so no single bone is involved, yet it is an animation system. [break] The most common form of Rigs is based on Bones. This special form of a Rig is also named Armature. [break] Rigging is the process of creating the Rig. Note: The Term “Rigging” is often also used as a synonym for Skinning (see below). We also find the term “Rigged Mesh” for example, which would actually be more accurately named “Skinned Mesh”. It is also very common to talk about “Rigged Characters”. Depending on the context it is often clear what is meant. [break] However since in Blender we clearly have to distinguish the processes and workflows, we should also use precise terminology. Thus we distinguish between Rigging (make the rig) and Skinning (weight the mesh). 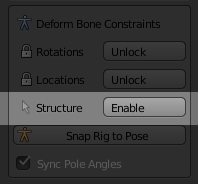 (1) Bone constraints and Bone Deform Settings are only visible in Edit Mode and Pose mode. The first row of buttons changes the bone shape. You probably will mostly select the Octahedron Style or the Stick Style. X-ray: To display bones even when they are occluded (hidden) by the mesh. Shapes: To enable the usage of Custom shapes. Limits: To display the bone movement ranges. Retarget (import of BVH Animations). The white arrow icon expands the panel to full visibility.For details about Workflow Presets see below. Skin is used when you want to do weight painting on your Mesh. This preset will enable the SL Bones and also unblocks their rotation setting so that you can rotate the bones for testing your weights. Pose is used for all your animation work. This preset enables the green control bones which are optimized for your Animation tasks. This is also the default preset forAvastar. Retarget is used when yuo want to import another Animation from a BVH file. Edit is used when you want to edit the Bone’s Rest poses, for example when you create a non human character. 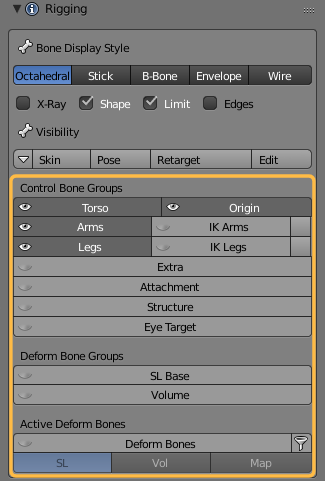 The Bones are grouped into 3 categories (Control Bones, Deform Bones and Active Deform Bones) and 13 subsets You can enable/disable the visibility of each subset separately by enabling the corresponding view button (see yellow box in image). 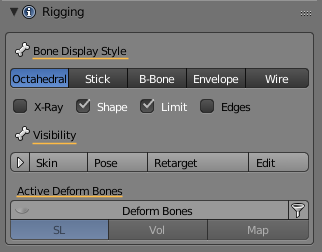 Note: The Bone Visibility Panel can be collapsed and expanded by clicking on the small arrow sign to the left of the Bone Presets. Avastar Bone Sets are described below in more detail. Extra: There are a few Extra bones which normaly are not used for Animation in SL. These bones are either not weighted to the default Avatar (Skull, Foot Bones and Toe Bones) or are automatically animated (Eye Bones). However you can use these Bones in your animations for custom meshes. 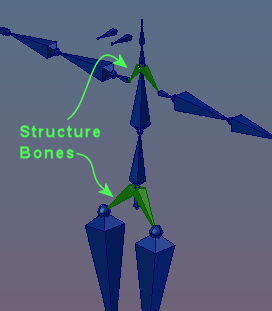 The Active Deform Bones are Bones which have the “Deform Flag” set. Only Active deform Bones can modify the mesh (via skeletal animation) when they have an associated Weightmap. Note: You can not disable the visibility of ALL bone groups. Hence at least one of the bone groups is always selected. Note: Selected elements (dark background) are made visible, while unselected elements get hidden. Not all bones take direct influence on the mesh. 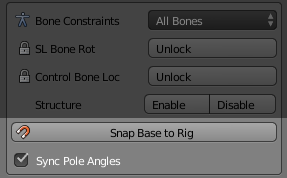 In fact by default only the 26 SL Base Bones of the 136 Bones in the Avastar Rig are directly used as Deforming bones for (classic) skeletal Mesh animation. If we want to create Fitted Mesh then we additionally have to enable the 26 Collision Volume Bones for deforming. Deform: Disable or Enable the selected Bones as Deform Bones. Hint: When your Skeleton refused to animate the mesh and when you are Sure the weight maps exist for your bones and they are filled with reasonable weights, then often the Bones are not marked as Deform Bones. In that case you can use this Panel for instant fixing. The Avastar Rig tries to keep most of its complexity under the covers. The most important and unfrtunately also the least understood part of the rig is its control bone section together with its set of Bone constraints. Here is a bit of information to shed some light on this. Due to the Bone constraints the SL Base bones can normally not be directly moved or rotated. Hence by default you have to move the control bones and weight the SL Base bones. When you Skin your Mesh (When you do weight painting tasks) then you almost always want to unlock the Bone Rotations of the Blue SL Base Bones. Then you are free to pose the Deform bones for testing purposes. When you Animate your Character, then you may want to unlock the Location Constraints of the Green Control bones, so that you can also perform Location animations. Hint: Although the Locking of Rotations and the Locking of Locations seems to be related, they actually are not. The unlocking is used to handle 2 completely different situations! It is important to get this sorted out and understand the difference as explained briefly above! By default the Structure Bones are not selectable. But when you work on non human skeletons you often want to reposition the structure bones as well. This is where the Structure Enable button comes into Play. When you enable Structure you can move the Structure Bones around just like all the other Control bones. The Snap Rig to Pose button is a quick way to make the current Pose the new Rest Pose. The Snap Base to Rig button allows to snap the SL Base Bones to the Control bones. You need this function whenever you have modified your Rig in Edit mode. Important: You should NEVER modify the SL Base bones in Edit mode. Please use always the Green Control Bones and then use this Snap function. Scope: Can be Selected Bones, Visible Bones, or All Bones. 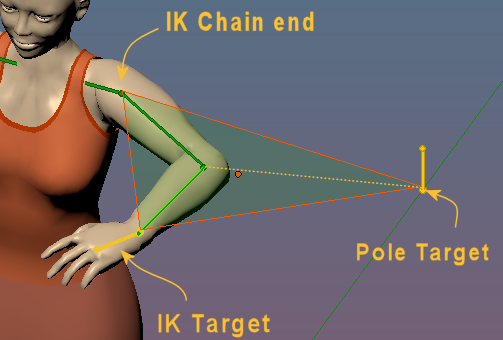 Pole Angle show up when you are working with IK Targets. It is important to have the Pole angle set correctly because otherwise you will see remarkable changes of your pose when you switch between FK and IK mode. So what is the Pole Angle? Imagine a triangle spanned by the three bones IKChainEnd, IKTarget and PoleTarget. In the left image below we have the Collar Bone (IK chain end), the Writ Bone (IK Target) and the Elbow Pole target. This triangle defines a plane in space. This pole plane is sketched as a transparent green triangle. Note: The pole angle is always defined for the Rest Pose. The bending of the Arm in the images above just makes it easier to spot how the pole plane is constructed. For a simple Rig like the Avastar Rig the Pole angle is typically 0°,90°,180° or 270° but it can have any angle actually. 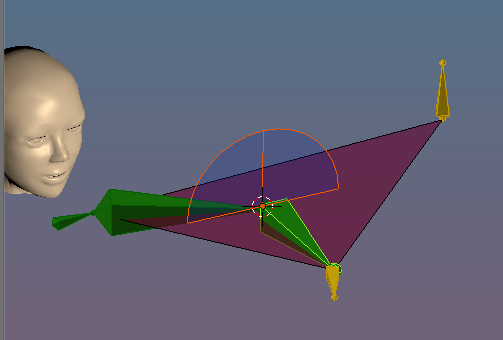 Blender allows to set the Pole angle manually. Avastar provides a function that calculates the optimal pole angle automatically whenever you switch from Edit mode to pose mode.